Hermann: was he alone, or not? At the weekend, top local history sort [Howmuch?] pointed this out to me, and we’ve decided to ask for opinions. This is just speculation, but seems an interesting point. I welcome any information that readers can contribute. We’ve visited several times here the story of the Hermann 2,240 pound unexploded World War II bomb found in a quarry in Walsall Wood by an unassuming excavator operator in 1968. 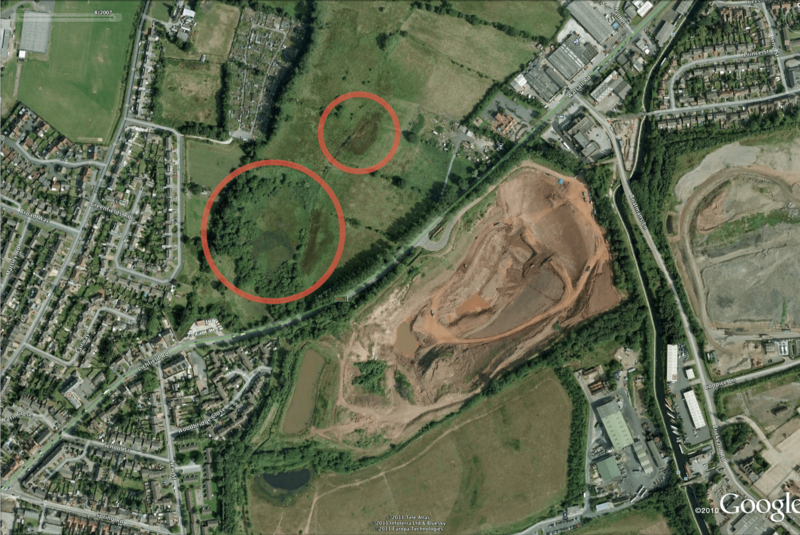 Whilst studying the excellent 1945 aerial images of the area on Google Earth, [Howmuch?] suddenly came over all Tamworth Time Hikes and spotted a witness in the landscape of Jockey Meadows that remains to this day. Google earth imagery dated 1945. The Lichfield Road runs top right to bottom left. North of it, there appear to be possibly two reasonably fresh craters. It may be possible that the pool directly to the south was so caused. Was this the same raid that dropped Hermann? 62-odd years later, this 2007 image shows fresh and strong vegetation around the still visible scars, consistent possibly with disturbed earth. To the south, of course, there's now a marlpit, latterly a domestic landfill site. Click for a large version. What do you know about wartime air raids in Walsall Wood, Brownhills and Aldridge? It’s interesting to see that the excavation on the south side of the Lichfield Road didn’t yet exist during the war, so where was Hermann actually found? Did we have many bombs dropped in the locality, or was it a thankfully rare occurance? Is this really bomb damage, or something else? If you have anything to add, please do comment here or mail me at BrownhillsBob at Googlemail dot com. Cheers. This entry was posted in Brownhills stuff, Environment, Events, Followups, Fun stuff to see and do, Interesting photos, Local Blogs, Local History, Local media, Reader enquiries, Shared media, Shared memories, Spotted whilst browsing the web, Walsall Wood stuff and tagged Air raids, Boatmans Lane, Brownhills local history, Hermann bomb, landscape, local blogs, Local History, New Photos, Staffordshire, Unexploded Wartime bomb, Walsall Wood, Walsall Wood Quarry, World War II. Bookmark the permalink. 7 Responses to Hermann: was he alone, or not? one daylight raid over Brownhills, near the Anchor. A resident hastened from where he stood on the double bridge in Pelsall Road to see if his house in Chester Road , Shire Oak, had been damaged. The stick of bombs from the lone bomber had landed in the field behind his house, killing the local Icecream merchant’s pony and causing blast damage to houses nearby. Perhaps the craters’ change in soil is still visible in the field. One night-time raid direct hit on building in Coppice Lane, behind present-day Focus.Residents went to observe the conflagration and returned home to find their shoes covered in candle wax. The building was a candle store! Was this the same raid as Hermann@s..what was the real target? Linley Wood underground ammunition dump? If you take the public footpath from Green Lane, near its junction with Mob Lane, and cross the fields to the rear of the Horse and Jockey you will appreciate just how wet this land can be. I expect the black and white photo may have been taken during the autumnal rainfall and the modern colour photo was taken during the dry season. Some of the fields are greener than others; coinciding with the lower part of the shallow valley. The mineral rights to this land was bought by Hoveringham in the 1960s. They or their successors may have more detailed information . I think the Hermann bomb landed in the sand quarry which belonged to Utopia brickworks..which you can see in the black and white photo. My father told me that a stick of bombs fell in the Norton Sidings area. There was a row of 31 (?) houses on the Pelsall side of High Bridges and the only significant damage was to the first and last house in the row, which were completely destroyed. I’ve always thought it strange that the coal mining and transport infrastructure was not more vigorously targeted, but maybe the Germans didn’t realise how impoprtant it was. 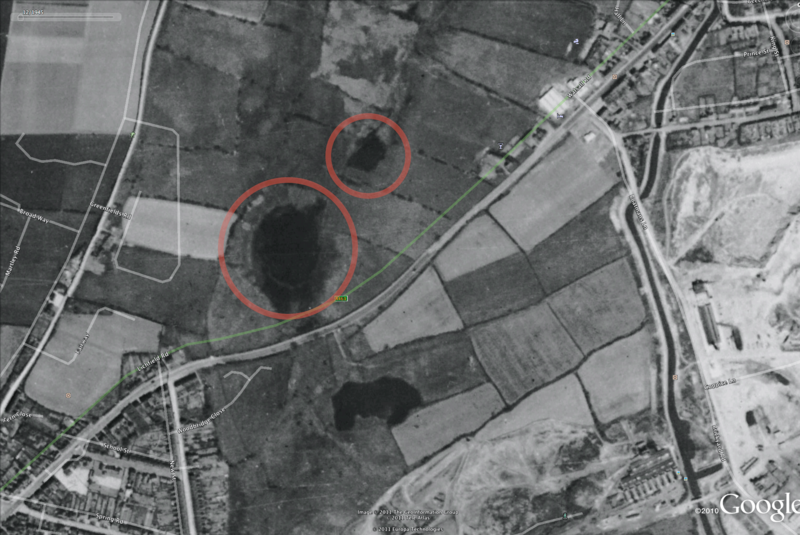 Some bombs were dropped in Chasewater, but I suspect these were simply off target (rather than just dumped as some suggest), especially if their aim was as inaccurate as the Allies’. Dad also told me that an incendiary landed in Brownhills High Street and was extinguished before it could do any damage, but I can’t remember any more details. There are still a few houses round and abouts Walsall with Anderson shelters in their back gardens. I always ask about them, being a bit of a geek.